Taylor Montgomery is a waste recovery company headquartered in Montgomery, NY, approximately 70 miles due north of New York City. We service sites in Orange, Ulster, Sullivan, Dutchess, Putnam Counties and parts of Pike, Greene, Columbia and Albany Counties and house one of the most unique construction and demolition recycling operations in the world. Over 95% of the waste we receive is converted into valuable end products. Why Choose Taylor? Green technology. Seasoned service. We hate to wait, too – Taylor knows that you need service now. RIGHT NOW! We are equipped to provide you with container or product delivery service, usually, within 24 hours, often on the day you call. And the line at our scale moves FAST. Don’t lose man-hours waiting in line; get in at Taylor, get out and get on with your next project. It’s all about your project – From delivery to pick-up, the Taylor team is available to make you project easy. Our sales, customer services and dispatch team will provide you with pricing, answer your questions and even visit your site. Our drivers make the difference – Our sizable fleet of trucks is manned by a courteous and professional driving staff, dedicated to the safety and security of your site, surroundings and belongings. It just takes one – One container can be used to remove all types of construction and demolition debris from your site; no need to separate material into different containers. 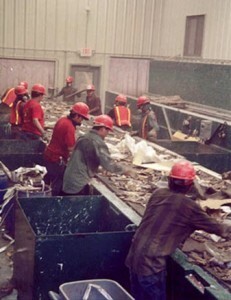 We do the separating for you at our state-of-the-art recovery and recycling facility, saving you time and money. Construction Contractors Association of the Hudson Valley – CCA’s Mission is to connect owners with responsible contractors who have demonstrated the ability to complete projects on time and within budget and to provide contractors with the resources, skills and support they need to be competitive in the 21st Century construction business. Construction & Demolition Recycling Association – The CDRA promotes and defends the environmentally sound recycling of Construction and Demolition (C&D) material through a diverse and unified voice of members committed to sustainability. Hudson Valley Builders & Remodelers Association – The Builders & Remodeler’s Association of the Hudson Valley, Inc. is that not-for-profit trade association representing the interests and needs of the residential building and remodeling industry in Orange, Dutchess, Putnam, Sullivan, Ulster and Westchester Counties since 1952. National Demolition Association – The National Demolition Association is the voice of the Demolition Industry – representing more than 800 companies engaged in a wide range of demolition activities. The NDA provides education, advocacy, and industry updates to members while increasing public awareness of the economic and societal benefits of demolition. Orange County Chamber of Commerce – The Orange County Chamber of Commerce leads the way creating and supporting an environment in which business will succeed and the quality of life is enhanced.